14th December 2018 is a special day in lives of Pak Hindu migrants especially the ones who have now become the residents of Ahmedabad, Gujarat. They got the Indian citizenship certificates (c.c.) 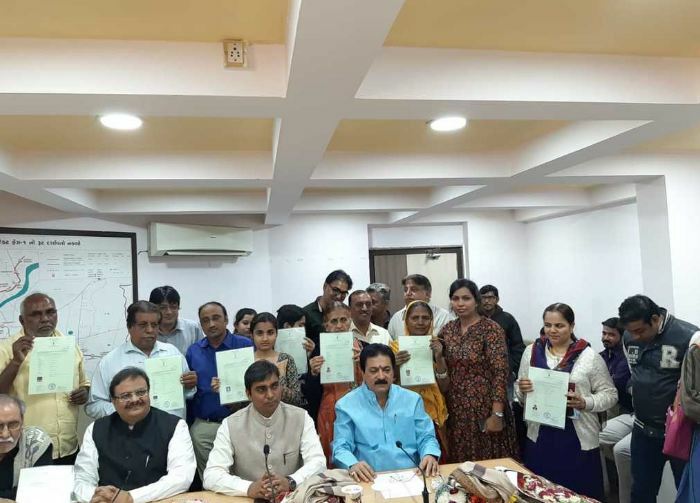 from Dr. Vikrant Pandey – Collector and District Magistrate Ahmedabad and Balrambhai Thavani MLA Naroda Vidhan Sabha, Mehul Dave ADC in the presence of District Collectorate officials, Hindu migrants, their relatives and well-wishers. 83 applicants have been issued citizenship certificates by the office of District Collector office Ahmedabad. The Collector told the large gathering of Hindu migrants that Gujarat Govt. is doing all needful for rehabilitation of the Pak Hindu migrants in Gujarat. Last year Gujarat Home Minister Pradipsinh Jadeja had distributed the 104 c.c. to Hindu migrants. Revenue Minister Kaushik Patel has also distributed letters and c.c. to 95 applicants in April 2018 at Tagore Hall. 90 c.c. were issued by Collector in June 2018. District Collector office has already issued 400 citizenship certificates in total so far after power delegation. Ahmedabad Dist. is first and still no.1 in issuing of Indian citizenship certificates to Hindu migrants in India, from the date of MHA notification of power delegation dated 23.12.2016. Prime Minister Narendra Modi union cabinet decision of July 2016 is being implemented in Gujarat with full enthusiasm. Sindh Minority Migrants Association Secretary Rajesh Maheshwari and the team have been representing the migrant issues with Gujarat Home department and Ministry of Home Affairs Govt. of India New Delhi. Ministers, MPs and have made recommendations to Govt. of India for early resolution of certain problems. Last year in April 2017, a Joint Parliamentary Committee on Citizenship under the chairmanship of Dr. Satya Pal Singh visited Ahmedabad. They held meetings with Hindu migrants in their localities Isanpur, Sardarnagar and got first-hand information. A Joint meeting of officials of MHA, MEA, Law Ministry, Gujarat Home department, FRRO Ahmedabad, District Collectorate and representatives of Hindu migrants was held at circuit House Ahmedabad on 18th April 2017 where the issues were discussed. Pak Hindu migrants, especially those who are the residents of Gujarat, are lucky that their voice is heard at the highest level. PMO, MHA, CMO, and Home department have been keen to address the problems faced by Pakistani Hindu migrants. Chief Minister of Gujarat Vijaybhai Rupani and Minister of State of Home Pradipsinh Jadeja have advised the concerned FRROs, DMs, and Home department officials to expedite the citizenship grant process to Hindu migrants in Gujarat. With concern and personal attention of the Minister, there is no pending case of citizenship with Govt. Some files are pending due to non-submission of documents from applicants. Hindu Migrant Kamlesh Mahadev is in a joyful mood today along with wife Chandrabai. On 14th December 2018, their sons Lalit, Prithviraj and daughter Ushabai have got Indian citizenship certificates. They had got citizenship last year under sec 5(1)(a). On the basis of parents, children applied under sec.5(1)(d) and 5(1)(e) and got c.c. Parents are happy because sons and daughter got the education in India and now they will get the job after getting Indian citizenship. Kirshanlal Chhugalal thanked each and every official of DM office personally after getting Citizenship certificate. His tears kept trickling down. Her wife Miran Bai got c.c. 2 months back. They have migrated to India 10 years ago with only passports and visa in hand leaving behind all house, business, household things at Pakistan. Why? Because their young daughter was kidnapped and forcefully married to a Muslim boy. No one bothered to hear their cry and so not surprisingly, justice and the daughter were both snatched in Pakistan. Kishanlal migrated with the rest of his family members, grandchildren in the hope of rehabilitation and in the hope of finding a place where he will be treated as an equal citizen. His wish got fulfilled on December 14th and he too got citizenship. He has also requested the Prime Minister, Chief Minister, and DM to allot/grant him a house under Prime Minister Awas Yojna (PMAY). SMMA will be jointly paying the installments of the house for Kishanlal family if he gets a house. He has already raised an appeal with the DM to look into the matter personally. SMMA Secretary Rajesh Maheshwari thanked Govt. of India for giving the power to delegate citizenship as now maximum no. of Hindu migrants can get the benefit. Once again Hindu migrants, their relatives, well-wishers, SMMA team are thankful to District Collector Dr. Vikrant Pandey and his team for the issue of citizenship certificates in minimum possible time. We look forward to their continued support in future also.